IRON COMIC: WHOSE ROUTINE REIGNS SUPREME? Iron Comic is a live gameshow where 5 comedians rush to write a routine in 8 minutes from topics suggested by the audience. At the end of the night, an Iron Comic will be chosen. Inspired by Iron Chef, each comic is forced to craft jokes while the clock is ticking. The next Iron Comic is at SF Sketchfest on Saturday, January 26 at Cobb's Comedy Club. Guests are Andy Kindler, Jackie Kashian, Dwayne Kennedy, Amy Miller, and Greg Behrendt. 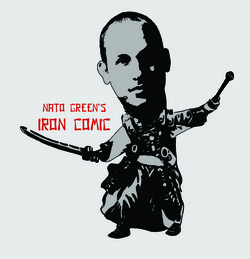 Iron Comic is co-hosted by Nato Green & Moshe Kasher. Listen to Iron Comic live at the High Plains Comedy Festival with Audible Channels on the Comedy Show Show with Will Arnett. ​Iron Comic has featured such comedians as Michael Ian Black, Dana Gould, Andy Kindler, Natasha Leggero, Michael Showalter, Eddie Pepitone, Todd Barry, Rory Scovel, Maria Bamford, Arj Barker, W. Kamau Bell, Pete Holmes, Kumail Nanjiani, Brendon Walsh, Ron Funches, Doug Benson, Matt Braunger, Greg Behrendt, Hannibal Burress, Janeane Garofalo, Kurt Braunohler, Eliza Skinner, Mike Lawrence, Jackie Kashian, Laurie Kilmartin, James Adomian, TJ Miller, Todd Glass, Michelle Buteau, Josh Gondelman, Shane Torres, Ian Edwards, Blaine Capatch, Guy Branum, Ali Wong, Emmy Blotnick, Wayne Federman, Aisling Bea, Kevin Avery, Adam Cayton-Holland, Andrew Orvedahl, Drennon Davis, Amy Miller, Mike Drucker, Will Franken, Chris Garcia, Emily Heller, Louis Katz, Sean Keane, Kyle Kinane, Alex Koll, Joel Kim Booster, Solomon Georgio, Jordan Doll, Brendan Lynch, Mo Mandel, Morgan Murphy, Tig Notaro, Randall Park, Chelsea Peretti, Johnny Steele, Baron Vaughn, and Brent Weinbach. 303 Magazine, "Large Outbursts of Laughter"
Laughspin, "blessing and a curse"
Laughspin, "ideal setting for performers"
Portland Mercury, "Moshe & Nato are charming, smart, and hilarious"
LA Weekly, "Iron Comic at UCB: Like Iron Chef for Stand-up Comics"
SF Chronicle, "Adrenaline Runs High"
SF Weekly, "Makes us proud." Portland Mercury, "Intriguing, rewarding, Cannot miss." Portland Mercury, "Lot of bang for the buck." Spinningplatters.com, "Non-stop laughs in many different styles." The Comedy Bureau, "Theater filled past capacity. Head to head."